The International Monetary Fund (IMF) estimates that 3% to 5% of the gross domestic product (GDP) worldwide is connected with illegal operations.1 This makes small nations like Cuba very vulnerable to political instability due to the lack of resources needed to combat this type of activity. As a result, Cuba opts instead to engage in illegal activities at full throttle. In addition, the economic situation of small third world nations has further deteriorated due to their need for hard currency and access to capital. Thus, economically developed nations must take into account this vulnerability in order to properly deal with illegal activities on a worldwide scale. Also, they can not dismiss the potential damaging effect of small nations like Cuba, which are fully engaged in illegal operations, on the overall financial well-being of the industrialized world, in spite of Cuba’s limited GDP. The damage can result from the fact that illegal operations nowadays are very intricate and complex, which makes it difficult to trace transactions and uncover assets. This complexity arises because perpetrators use elaborate shell companies, and existing and newly-created financial institutions, to funnel money and legitimize the proceeds at different times and in different places. More-developed, market-oriented nations, as discussed in this paper, have contributed by their policies to this phenomenon. In order to correct the problem, developed marketoriented nations must take a hard look at their own political and economic policies, and examine in a clear light how these policies have contributed to the establishment and development of global illegal activities. Without a hard, honest, and responsible effort to correct the problem both in form (enacting of laws) and substance (law enforcement), the situation can not be properly controlled. Reform will also contribute to the financial well-being of third-world nations as the plundering and looting in these countries diminish. The purpose of this paper is to address the potential effect of illegal activities in a post-Castro Cuba. Before attempting this task, certain constraints and obstacles encountered in the research of the paper have to be noted so that its contribution can be put into the proper context. Illegal activities are not an area of research for which material is readily available. Most of the materials we have used are declassified U.S. Federal Bureau of Investigations (FBI) files, documentaries, and investigative reports done by journalists in the U.S., as well as some personal interviews with knowledgeable persons. Some of the materials involve Cuba directly and others do not, but all of them are necessary to obtain an understanding of the subject matter. In addition, the materials examined are viewed from the skeptical eye of an auditor who is not satisfied unless the information gathered is total, complete, and accurate. The factors used by an auditor during a regular audit can not be satisfied in this case, however, for the data available is very limited. The best that can be done is to take the information reviewed at face value and to expect it to be accurate. Since different credible sources seem to be agreeing on the same points from their different perspectives, I feel very confident that the material presented is truthful and without bias, although not all the facts may be available. It should also be noted that investigative reporters use interviews with the people affected by illegal operations as a technique to gather information, with some data tested to confirm what individuals have told reporters. Such confirmation is needed since the persons interviewed could give misleading information due to potential political, economic, or physical risks that the interviewees consider real. In addition to verification of the information, background checks of the persons providing information are often conducted. In this paper, I follow a historical approach to illegal operations, since a succession of causes and effects must be dealt with in order to correct the problems associated with the causes. First, I will examine illegal operations before Castro, then illegal operations worldwide, and finally illegal operations during Castro’s government. Illegal operations before Castro note the influence of the United States, while illegal operations in the Soviet Union add a Russian touch to it. Both American and Soviet influence on Castro’s activities are good indicators of illegal activities in a post-Castro Cuba. This paper is not an exercise in forensic accounting, the field of study that deals with asset recovery, for two reasons. First, Maria Werlau, in her paper, “Fidel Castro, Inc.: A Global Conglomerate,”2 has noted many of the corporate assets held by Castro and his family and I do not wish to be redundant. Second, recovery of these assets for the benefit of the Cuban people involves negotiations between countries in the international community of which the present government of Cuba is a party. It can be safely assumed that no changes to the status quo would take place until Castro relinquishes power. Nonetheless, it should be noted that Switzerland (and there could be others) has allowed for examination of bank accounts by law enforcement agents when it is suspected that the monies deposited involved narcotics trafficking or terrorism. The Godfathers of Havana, a TV documentary based on declassified FBI files regarding illegal operations in Cuba prior to Castro’s regime, comprises most of the information noted in this section.4 This documentary was aired on the History Channel in 2006. The information has been rearranged in chronological order to more effectively analyze the development of illegal activities in the island nation. Illegal operations in both countries had their origins during the Prohibition era in the United States in the 1920s and early 1930s, when alcohol sale, manufacture and transportation were illegal. In the U.S., gangsters were responsible for the delivery of illegal alcohol. Cuba provided these gangsters with the needed rum supply. In 1933 a deal was made by Meyer Lansky, the so-called Napoleon of organized crime and its financier, with Fulgencio Batista, who had seized power in Cuba. The New York mafia member in charge of the operations in Cuba was Lucky Luciano, whose job was to ensure that rum left Havana Harbor for the United States. In the 1930s two important events took place in the U.S. that restrained Cuba’s operations. Thomas E. Dewey, former mayor of New York City and governor of New York State, declared a war on the mafia. Lucky Luciano ended up in prison, Lansky moved to Florida, and Prohibition was ended in the United States. Daily mafia operations in Cuba after Luciano went to prison were delegated to Santos Traficante, Sr. In the aftermath of Prohibition, Lansky looked to Havana to begin a new business venture. He was able to get the gambling concession in the Hotel Nacional. In the 1940s, when war was taking place against the Axis powers in Europe, Lansky and Luciano made a deal with the U.S. Navy, giving the Navy access to the New York City waterfront in order to prevent submarine saboteurs from entering New York’s harbor. For Lansky this was an opportunity to go straight and for Luciano to get out of prison. Luciano’s contacts in Sicily helped the Allies’ war efforts. In New York, Dewey ran for governor and won after receiving a $250,000 campaign contribution from Luciano. Luciano was pardoned because of his war efforts with the condition that he be deported to his native Italy. Luciano accepted, but after arriving in Italy, he left for Havana and resumed control of operations there. In Cuba, Batista lost the election in 1944, but returned to Cuba from his Florida residence at the end of 1946. Around 1947, Havana became the distribution center for heroin moving from Marseille, France, to the United States (New Orleans, Tampa, and Miami). At that time, war with the Mafia resumed in the U.S., and Luciano was again deported to Italy. Lansky remained in Havana overseeing his gambling business. In the 1950s, Batista returned to power in Cuba. Batista’s payout in the gambling operation was estimated at from 10% to 30% of the total take. At this time, gambling and tourism thrived in Havana and the Riviera Hotel was completed. This increase in business also increased the presence in Cuba of the mafia and other organized crime families in other cities in the U.S. Santos Traficante returned to Havana to oversee the growth of the gambling business. In New York at this time, the Kefauver Crime Team started investigating the mob, especially after the gun down of A. Anastasia in a barbershop in 1957. Many mob members were arrested even though in 1958, J. Edgar Hoover, the FBI Director, had claimed that the mob did not exist. In 1958, there were many bombings and social disturbances in Havana, with the unrest scaring tourists away. Santos Traficante, Havana’s mob boss, donated money to Castro’s revolution to hedge the mob’s investment in Havana’s gambling casinos. At this time, Meyer Lansky left Havana, but Traficante stayed. When Castro won, he immediately put Santos Traficante in prison. With this act, Castro closed the doors on the Mafia bosses from the U.S. and opened the doors to criminals from the Soviet Union. Castro used what he learned from these mafia leaders, to establish his power in the island during the first years of the revolution. Afterwards, he added the Russian flavor to it. It should be noted that when this study was started early in 2006, I was unable to access Meyer Lansky’s file on the FBI web site, although, according to other sources, he had died from lung cancer in the early 1980s. Some of the mafia’s Havana members went on to Las Vegas to establish their successful gambling businesses in Nevada. Some were killed by their own members, others continued to skirt the law, and Lansky appeared to have died broke. Files are declassified after twenty-five years. I note this because law enforcement must out of necessity keep some of the information secret so that future investigations can be successful. So it appears that years after his death, Lansky’s influence on organized crime still affects current investigations. Information regarding illegal activities in the former Soviet Union prior to Castro comes from an address to Congress by the FBI’s Michael Morehart in 2006. Illegal activities today can be traced back to the czars and the Russian Revolution. Two main trends in Russia’s history have played a significant role in Castro’s Cuba. First is the blurred distinction between what is private and what is public. This lack of distinction permeated Russian society during the czars’ era, allowing those working in the czars’ estates the free use of available goods without committing a crime. Second is the close collaboration between the criminal element and the Bolsheviks. This alliance brought about the overthrow of czarist Russia and bolstered the first group of revolutionaries who took power right after the overthrow. It succeeded by controlling the population by provoking riots (social unrest) in the face of shortages of food and other necessary commodities. Thus, the state became responsible for controlling the goods being produced in its society. The distribution of supplies fell under the control of the criminal element, which aided in the creation of both a shadow economy and a black market.5 The shadow economy dealt with “legal” goods, sold off the books, and it operated outside the state economy. The black market, by contrast, dealt with illegal goods, such as drugs and other items that were prohibited from use by the population and that came mostly from the West. In the 1960s, another element among the criminal groups became important. This group originated within the prison system, or Gulag. In this group were the most sophisticated and most dangerous of the professional criminals. They are probably comparable to organized crime, and referred to by some as the Russian Mafia.6 They live within a set of rules known as the “thief’s law” that were totally outside the murky legal system. Unfortunately, today this last group has permeated business and social enterprises in Russia to a degree unparalleled in the rest of the world. This group operates the “pyccko” (roof) and extorts bribes from businesses in the major cities for the protection or security of the businesses under their control. Former police and KGB agents have set up their security businesses and are part of the same criminal element. In more recent years, as communism tumbled and as the state’s holdings were sold to private citizens, Russian mobsters have partnered with government officials to purchase valuable properties. These properties have been sold to this select criminal group since they are the ones having the “inside information” when the properties are offered for sale. Since there are no competitive bids, the properties have been sold at fire-sale prices. However, how much was sold at such prices could not be accurately determined, since in the prior communist state there was no buying or selling of property as in the West. Thus, it was difficult to determine the true market value of property changing hands. As seen in pre-Castro’s Cuba, illegal operations in the U.S. and most of the Western Hemisphere, yesterday and today, arose from a need to supply a good and/or service that was not acceptable to society. During Prohibition it was liquor, later it was heroin, and then gambling. Today, illegal narcotics trafficking involves cocaine, heroin, methamphetamines, marijuana, and other drugs sold through a sophisticated worldwide business network. As before, illegal goods command a higher profit to compensate for the risk involved (the greater the risk, the greater the rate of return), but unlike before, illegal operations are very organized, with many resources available to those involved in them. The motivation continues to be greed. As greed is satisfied, the criminals’ next step is to try to obtain power or influence. The latter has been accomplished by contributions to political campaigns for favors, whether the lessening of prison sentences, the legalizing of an activity, etc. In the long run, however, some of these criminals have used the money to establish their own legal businesses in order to be accepted in society. Government officials, however, have restrained the operations of these criminals, mostly after either public outcry or after a gun down of either a mobster or a law enforcement agent trying to curtail the criminals’ operations. Illegal businesses, highly regulated in the U.S., have moved their operations overseas, where they are either legal or under less government regulation and scrutiny than in the U.S. In the former Soviet Union, criminals were also motivated by greed. However, because of the shortage economy, essential goods (e.g., food) rather than prohibited goods (e.g., drugs) were the basis of their activities. In addition, because of criminals’ direct association with government leaders, the criminals did not mind using coercion on a regular basis to obtain their monetary results without retribution from the government. Again, both the shadow economy and the black market (underground economies) operated outside government parameters, creating a lack of distinction between goods that benefited society and those that did not. Also, the blurred distinction between what was private or public property continued. Later, as the privatization process took place, the criminal element, usually referred to as the Russian Mafia, aided by government officials, benefited from the sale of valuable properties at fire-sale prices. Between 2003 and 2005, The New York Times published several articles regarding illegal activities involving four major areas (according to revenue): drug trafficking, illegal arms dealing, illegal arts trading, and human trafficking. This last area involves anything that affects human beings, including assassination, laboratory or medical experimentation, child slavery or snatching, prostitution, and kidnapping. Gambling is not considered an illegal activity nowadays and is no longer noted as such, since it represents a substantial source of revenue in the U.S. and other parts of the western world. Nonetheless, gambling does play a role at times in the money-laundering process (legitimizing illegal proceeds) alongside cash-intensive operations such as convenience stores, car washes, grocery stores, as well as the purchase of real estate, investment assets (mutual funds, stocks, and bonds) and insurance assets (life insurance and annuities). Legislation passed by the U.S. Congress usually addresses the protection of financial institutions and related assets. It is not as effective, however, in controlling other aspects of illegal operations, probably because the approach of the FBI, the main law-enforcement agency, is to follow the money. Commencing late in the 1980s and significantly increasing after September 11, 2001, laws have been enacted that enhance the powers of law-enforcement agencies around the world. The expansion of the Financial Crimes Enforcement Network (FinCEN) under the U.S. Department of the Treasury is one of the ways that the U.S. government has responded to the crisis to combat illegal narcotics and terrorism around the world. FinCEN, the financial intelligence agency of the United States, is a member of the Egmont Group, an international consortium of financial intelligence units in more than one hundred countries that collect and record suspect financial data and make it available to other financial intelligence agencies within the group. In addition, other nations in the international community have become members and have endorsed forty anti-money laundering and nine anti-terrorist financing recommendations of the Financial Action Task Force (FATF). More than one hundred and fifty countries have implemented these measures. The Bank Secrecy Act (BSA) was enacted in 1986 to ensure that banks in the U.S. report significant financial transactions (more than US$10,000) as a means of overseeing any trends in the flow of money. Fin- CEN has enhanced the definition of what constitutes a “financial institution” responsible for the recordkeeping and reporting requirements of financial transactions to include insurance companies, investment brokerage firms, commodities and futures brokers, and wire-transfer companies. Also, the recordkeeping and reporting parameters have changed. If a suspicious activity is encountered, reporting can cover financial transactions of as little as US$3,000. The U.S.A. Patriot Act of 2001, passed after the September 11 attack, allows financial institutions, within certain constraints, to share information with one another for the purpose of identifying and reporting money laundering or terrorist activity. In addition, it allows the government—under Section 319(a) of the Act—to seize assets held in a U.S. correspondent account of a foreign bank if evidence suggests that proceeds from criminal activities were deposited abroad. In the 1970s, Cuba was allegedly involved with the Montonero guerillas in extracting money from the kidnapping of Argentine industrialists Jorge and Juan Born.7 Castro’s payout was estimated at $60 million and is believed to have been deposited in a Swiss bank account. Other activities in which Cuba was involved include the transportation of gold and precious stones from the Middle East (Lebanon) to Czechoslovakia from bank robberies carried out by the Palestinian Popular Democratic Front, and funneling of arms to Nicaragua’s Sandinista rebels in their struggle against Somoza. Pre-embargo Illegal Operations: Based on the efforts to combat the narcotics trade and terrorism by the international community, the following sanctions could be imposed on Cuba until it is removed from the state terrorism list or at least complies with the provisions of FinCEN and FATF. • Remittances to Cuba could be stopped to ensure that Cuba complies with the provisions enacted by international community watchdogs. Depending on Cuba’s reaction, there can be freezing of bank deposits by regulators in other parts of the world. Please refer to the appendix of Werlau’s paper for a partial list of companies. • Works of art might leave the island for those either buying art pieces or for payment of goods and services demanded by current and potential trading partners. • Some real estate would change hands at a good price, if not bargain-basement prices. Most of the real estate will be prime land such as waterfront property. Post-embargo Illegal Operations: Illegal operations will continue in areas that do not directly affect other members of the international community. It will involve activities highly regulated in developed market-oriented countries. I feel that illegal activities will continue in both the health field and the tourist industry. In the health field, such activities would be the result of Cuba’s advances in this area as well as its significant number of doctors per capita who could be involved in active research. Activities could involve lab and medical experimentation on humans as well as the use of human organs for transplants. In tourism, illegal activities could continue to involve prostitution, gambling, and money laundering. Illegal activities in general will be very significant for a Cuba in transition. Díaz-Briquets and Pérez-López note in their mentioned book that controlling corruption can accelerate or restrain the progress of the country towards a market-economy. Their argument is based on the fact that socialist countries in the Eastern European bloc that were more successful in their own transitions were those that were more effective in combating corruption. Corruption, however, takes many shapes and forms. The prevention of illegal activities, however, requires specific preventive controls over the banking system, money-exchange houses, wire transfer services, or any other service in which an exchange of money takes place. The other critical area is an independent and effective judicial system to carry out judgments, which in Cuba at present needs to be revamped. These preventive measures should be addressed by the criminal courts and police properly trained in these laws. Other practices that are important in combating corruption were eliminated or suppressed during the socialist era in Cuba and are noted by Díaz-Briquets and Pérez-López. They include the elimination of accounting controls, development of budgets for government agencies, and the education of certified public accountants and administrative personnel. Without proper accounting and management controls over public or private entities, corruption will continue its course, creating further disruption in the economy. The authors have provided a detailed account of corruption in Cuba since the inception of the republic. My paper addresses illegal activities in order to reiterate the need for a proper system of checks and balances in both a future Cuban society and any future organizational entity within the society, whether private or public, since illegal activities are usually carried out within a legal structure. In addition, however, I want to reinforce the importance of compliance with the international community to abate corruption. Noncompliance with the international community’s prerequisites can result in the cessation of financial and technical assistance. It should be noted that laws and regulations regarding illegal activities on a worldwide scale are recent and have been in a state of flux for the last few years. Two tables included in this paper list some of the laws passed in the U.S. to combat money-laundering and drug-trafficking, and have been used as the basis for other member countries of Egmont to combat this problem. Table 1 lists measures regarding banking and the financial industry. 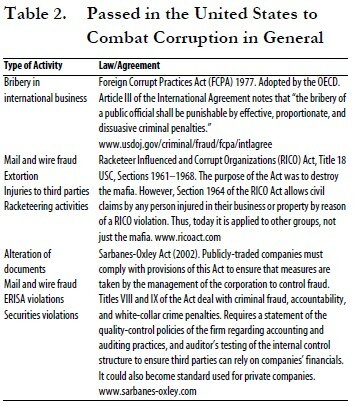 Table 2 notes laws passed in the U.S. to combat corruption in general. The tables can be used as a guideline for the changes that the country needs to make in the future to combat corruption. It should be noted, however, that the tables do not address all aspects of illegal activities, including production, transportation, and distribution of narcotics, and address only the financial reporting regarding customs. Four areas not addressed by the paper that should be taken into account. First, laxity in regard to customs tariffs and inspection can encourage the smuggling of narcotics or other goods as well as exposure to terrorists. Second, as loans are granted by the World Bank or similar entities and projects are started in the country, controls must be exercised over procurement, materials and supplies, and check processing. Third, behavior modification is needed to educate the population to respect the difference between private and public property. Unobtrusive controls such as video cameras and alarm systems can be used to monitor behavior, and reasonable measures can be taken to discourage theft. The best deterrent, however, is to pay employees reasonable wages. And fourth, while the budding oil industry can be positive for the country’s economy, former Soviet Union nations around the Caspian Sea have been subjected to social disruption, violence, and public acts of defiance because of oil companies paying bribes to government officials to gain access to natural resources. It is critical that Cuba handles payments for development of natural resources as contributions to the development of the country rather than as personal contributions to government officials’ pockets. To conclude, Cuba’s future depends on controlling illegal operations and all types of corruption. The country’s leaders can make this happen if they commit themselves entirely to the long-term development of the country for the benefit of its citizens. 1. Morehart, Michael (May 18, 2006). Statement before the House Committee on Financial Services. Section Chief, Terrorist Financing Operations, Counterterrorism Division of the Federal Bureau of Investigation. 2. Werlau, María C. (2005). “Fidel Castro, Inc.: A Global Conglomerate,” Cuba in Transition—Volume 15. Washington: Association for the Study of the Cuban Economy. 3. Díaz-Briquets, Sergio; and Pérez-López, Jorge (2006). Corruption in Cuba: Castro and Beyond. Austin: University of Texas Press. 4. “The Godfathers of Havana.” History Channel. June, 2006. Documentary on criminal activity in the island prior to Castro’s regime from declassified FBI files. 7. Oppenheimer, Andrés (1992). Castro’s Final Hour. New York: Simon and Shuster, p. 39. 10. Potts, Mark; Kochan, Nicholas; and Whittington, Robert (1992). Dirty Money—BCCI: The Inside Story of the World’s Sleaziest Bank. Washingon: National Press Books, p. 181. 11. Latell, Brian (2002). After Fidel: The Inside Story of Castro’s Regime and Cuba’s Next Leader. New York: Palgrave MacMillan, pp.188–189. 12. Libya was removed from the state terrorist list while this paper was being prepared.